I am glad to learn about your considerations. Your curve look [sic] interesting. First let me say that I think that your number m is not so good as the number twice as large. This was discussed by Kapustinsky twenty years ago. He called it the Madelung constant per valence, and pointed out that its value is approximately 1.65. This is, of course, essentially your original suggestion. Also, I do not think that there is any doubt about the correct value of the Madelung constant. If I remember correctly, I pointed out to Jack Sherman, who was working in our laboratory, that I was doubtful about the Emersleben value, and Jack recalculated it. He found that Emersleben had made a mistake, and that he had just copied Ebersleben's mistake when he thought he was checking Emersleben's value originally. The value that he found, referred to the edge of the unit, is 5.12972. This puts cuprite exactly on your curve. I think that your curve might well be worth publication - that is, the value of the Madelung constant per valence bond as a function of the harmonic mean coordination number. It would, of course, be good if you could express your curve by some simple equation. The reference to Sherman's paper on the Madelung constant of cuprite is Z. f. Krist.,(A)87, 342 (1934). Since he made the calculation by Ewald's method twice, as well as by the Grundpoten-tialen method, there can be, I think, no doubt about the correct- ness of this number. Letter from Maurits Dekker of Interscience Publishers, Inc. to LP RE: Dr. Proskauer. 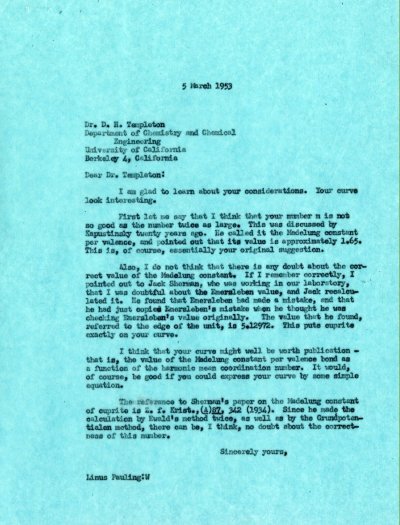 Writes that he has informed Mr. Dekker that LP has consented to look through the proofs of Rutgers' Physical Chemistry by Dr. Debye. The proofs are being sent and they request comments. [related letter from LP to Mr. Proskauer] [Filed under LP Correspondence: Box #313, Folder #1].